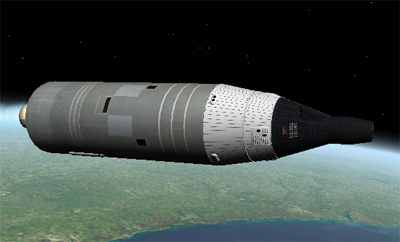 The Gemini program was designed as a bridge between the Mercury and Apollo programs, primarily to test equipment and mission procedures in Earth orbit and to train astronauts and ground crews for future Apollo missions. The general objectives of the program included: long duration flights in excess of the requirements of a lunar landing mission; rendezvous and docking of two vehicles in Earth orbit; the development of operational proficiency of both flight and ground crews; the conduct of experiments in space; extravehicular operations; active control of reentry flight path to achieve a precise landing point; and onboard orbital navigation. The main objectives of Gemini 1 were to test the structural integrity of the new spacecraft and the Titan-2-GLV launch vehicle. Another objective was to test the new tracking and communication systems for the Gemini program and provide training for the ground support crews for the first manned missions. The planned mission of this capsule lasted only three orbits. The spacecraft itself remained intentionally attached to the second stage of the rocket and there were no plans for recovery. The Gemini 1 capsule was built specifically for this mission and differed significantly from the later operational capsules (Gemini 2 to 12). It lacked life support systems and had ballast instead. A heat shield was mounted, but four large holes drilled in it to make sure that the spacecraft was destroyed during reentry. In place of the crew couches were measuring equipment that relayed telemetry measuring the pressure, vibration, acceleration, temperature, and structural loads during the flight.